Fiat 500 sales have begun in China. 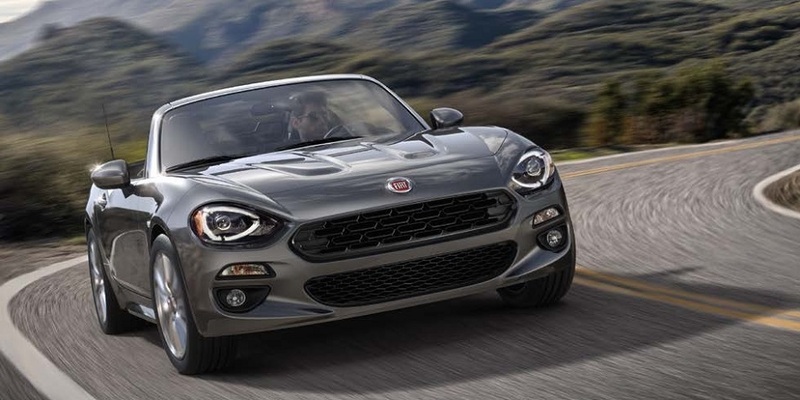 Fiat is taking orders in a pre-sale that runs between now and the official launch date, September 15. To celebrate the arrival of the Fiat 500 in China, Fiat has commissioned the running of a limited edition of 100 cars to be customized by 5 Chinese artists. 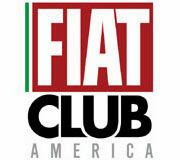 The Chinese Fiat 500 will be assembled at the Toluca, Mexico plant and will be based on the North American Fiat 500. 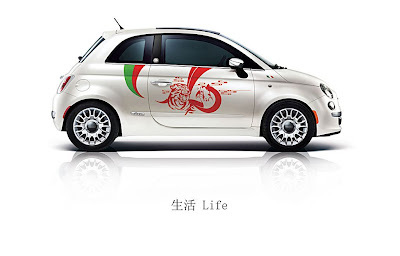 The 500′s main goal is to establish the Fiat brand in China, showcasing the brand and its image. Yearly sales are expected to be between 7,000 to 10,000 units. 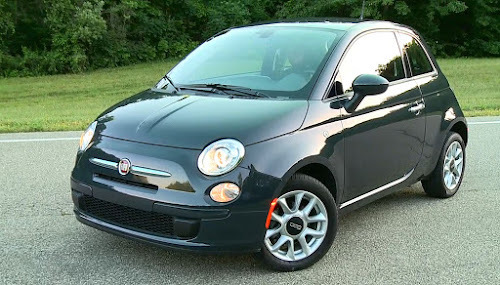 Personally, I think once the Chinese sample the charismatic Fiat 500, those figures will be revised upwards! 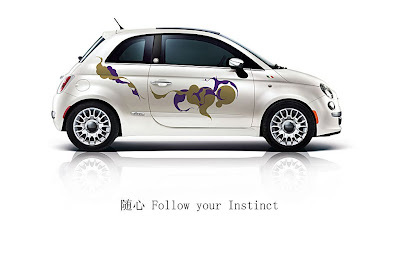 Lorenzo Sistino, Fiat Group Automobiles Executive Vice President International Operations, presented the Fiat 500 “First Edition” made exclusively for the Chinese market and embellished by the creative graphics of five young Chinese designers, earlier today in Shanghai. This Limited Edition – 100 numbered units – will be featuring in an original initiative ahead of the official launch of the 500 on September 15. Everyone who places an order for a Fiat 500 from July 12 to September 15 will take part in a final drawing entitling them to replace the car they ordered with a Fiat 500 “First Edition”. "The start of the pre-order stage is a fundamental stage for the 500 launch in China and will mark an important step forward in the joint project of Fiat and GAC", declared Lorenzo Sistino. "The objective of the 500 is to position our brand on this market because it is the model that best expresses the values of Fiat". Based on the 500 Lounge, the “First Edition” has a special three-coat pearlescent white body colour, red leather interiors and a special badge on the door pillar. Under the bonnet, it fits a 1.4 litre MultiAir, the petrol engine that won the “The International Engine of the Year Award 2010”. Combined with an automatic six-speed transmission, the innovative engine delivers a top power of 101 HP (75 kW) at 6500 rpm and a torque of 133 Nm at 4000 rpm. 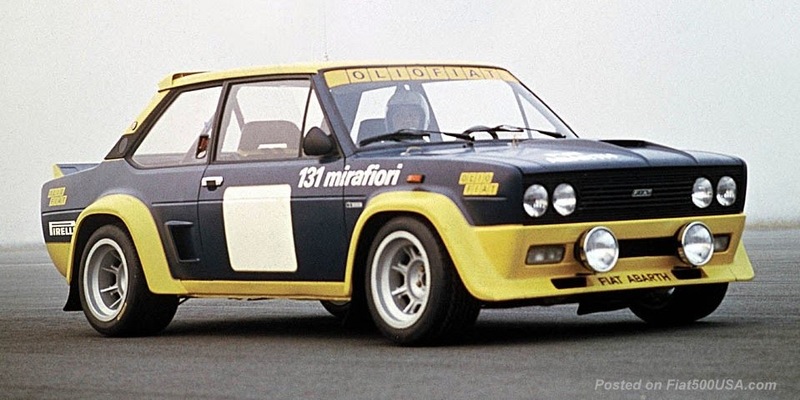 The real particularity of the Fiat 500 “First Edition” is its special livery, as Lorenzo Sistino explained. “The 'First Edition' is a special offer exclusively created for Chinese customers and represents a symbol that joins our two cultures. Not by chance, we asked five young Chinese artists to interpret the relationship between our two countries in a creative, original manner, and to fashion a tribute for the launch of the 500 in China. The 500 will have many versions and special series, in addition to the 100 “First Edition” models. Next year we will be launching the 500C convertible and the exclusive “500 by Gucci” special series. 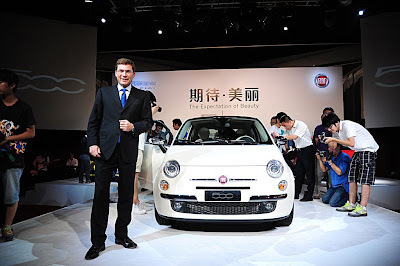 The Fiat 500 is the first important step of Fiat in this great market: by the end of 2012 we will have launched a new saloon made entirely in China at the plant in Changsha with our partner GAC". 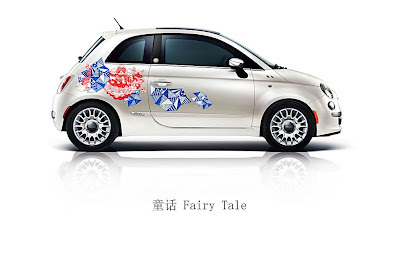 In detail, the five exclusive high-impact designs on the sides of the car cleverly symbolise the bonds between Italy and China. The first designer is Leilei, an avant-garde artist who has won many important awards in China and in other countries. Use of elements from national popular culture is predominant in his works. The second young designer is Mee Wong, illustrator and teacher at the Guangzhou Art Institute. Her favourite creative element is the panda, the animal which symbolises Chinese culture. Asian tradition is again the inspiration for the third artist, Benny Luk, an award-winning designer of international fame, who combines graphics and web design. Next is Nod Young, a visual artist with a unique style whose artwork has been exhibited in many countries, including the UK, Germany, the USA, Italy, South Africa and China. Drawing and illustration master Yan Wei completes the line-up. She employs traditional Chinese patterns and her works have been displayed in some of the most famous art galleries of Shanghai, Beijing, New York and Tokyo. 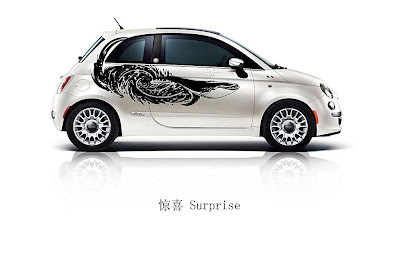 Made in Toluca (Mexico), the Fiat 500 marketed in China has an entry-level price of 190,000 RMB. The range includes three trim levels (Pop, Sport and Lounge), one engine version (1.4 MultiAir 101 HP), an automatic six-speed transmission, 12 body colours (metallic, non-metallic and three-coat pearlescent), 9 colour-material combinations for upholstery and two interior environments (black or ivory). In brief, this amazing A-segment four-seater ensures a great handling experience and unprecedented feeling with its ideal city size, its thrilling driving dynamics, its brand-new 1.4 litre MultiAir engine, its innovative Blue&Me hands-free communication system and seven airbags as standard. 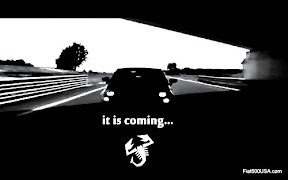 What is your opinion regarding the initial sales result of Fiat 500 from March to June? I understand that the real sales starts now, but what is your forecast for the months to come. Take care. 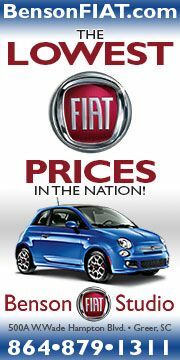 Through June, Fiat has sold 4,944 500s in the United States, outside estimates are between 30,000 and 35,000 units in 2011. Original talk was between 40,000 and 50,000. However, the slower pace of rolling out the dealer network and the subsequent waiting for that to happen before full scale advertising begins have, naturally, impacted sales. The bright news is 5,000 cars isn't bad considering most of the advertising to date has been on line. 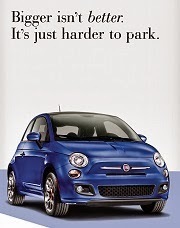 The other good thing is Fiat isn't lowering their standards just to get dealers open. This will pay off in the long run.